Here is your chance to watch an edition of Go Digital from 2002. Click on the links below to chose the program of your choice. Click here to watch programmes from 2001. 30 December - All the best from this year's Go Digital, including looking at the technology that changed 2002. 23 December - The technology behind the Beagle 2 robot destined for Mars and the music software that adapts to your mood. 16 December - Why mobile phones are going to be easier to recycle and how al-Qaeda uses the web to spread its propaganda. 9 December - An insight into the websites blocked by China and we look at one of the world's most powerful supercomputers, yours to own for just $2.5m. 2 December - How China is getting tough with the internet, using mobile phones to keep tabs on your health and your own personal rover robot. 25 November - Schools in Namibia turn their backs on Microsoft and the row over a website in Greece about the treatment of conscripts. 11 November - Silk Road treasures united on the web, virtual exhibits bring the past to life and the environmental cost of making a microchip. 4 November - Going online in Singapore, how digital images could change many elements of design and teaching and the latest on the Simputer. 28 October - Pupils in Bangladesh discover the web and how telecentres in Senegal are offering opportunities for further education. 21 October - We look at ways of using technology to improve the health and welfare of people in Bangladesh and Senegal. 14 October - Hear how Senegal's militant Radio Oxyjeune is changing listeners' lives and how Bangladeshi people keep in touch with relatives overseas. 7 October - How village women in Bangladesh and Senegal are using mobiles to run thriving businesses and plans to create a software industry in Bangladesh. 30 September - Using technology to track bird movements, the future of the internet and how satellite technology is being used in developing countries. 16 September - The CD-Rom helping farmers fight crop pests, the world of online gaming and how your voiceprint could replace your password. 9 September - The impact of September 11 on privacy, Greek gamers fight ban and how computer games are changing. 2 September - How computer games are getting more intelligent, having your say on the environment through the web and how robots are becoming more organic. 26 August - How computer programs are helping us speak in foreign languages such as Hindi and Croatian, and net pioneer Esther Dyson on making the internet more democratic. 19 August - How better computers are helping us hunt aliens, the row over Linux and the wedding photographer who is a robot. 12 August - Using satellite technology to track children, a portable ultrasound scanner and magnetic chips promise faster computers. 5 August - Recycling discarded mobile phones, the perils of e-mail and turning hi-tech into high art. 29 July - The youth clubs helping children learn about computers, the websites blocked by Saudi Arabia and ensuring secure credit card transactions. 22 July - The computer that is helping to fight obesity, getting the internet for free and the latest in digital animation. 15 July - Delivering the internet to India's villages, Canada's Inuit people take to the web and the challenges in setting up a news website in Urdu. 8 July - Why China is tightening controls on the internet, the cyber-rebels based at sea and how your eye could replace your computer mouse. 1 July - The website in Argentina where a click means a meal and Icann's boss Stuart Lynn on changes to the organisation that oversees the running of the net. 24 June - An assessment of how the net "snooping" laws in the UK were reined back and a look at the future of digital actors. 17 June - Iranian women speak out on the web, how scientists are packing more information into smaller devices and what you computer desktop says about you. 10 June - China's plans to limit radiation from mobile phones, archiving old Scottish dialects on the internet and the technology behind this year's Commonwealth Games. 3 June - A World Cup special, looking at who controls what football you can see on the web, the robots vying to be world champions and the computer simulation predicting a Latin victory. 27 May - Tight new controls on the internet in Turkey, putting old school friends back in touch with each other and why technology is good for your social life. 20 May - How technology can unleash a child's imagination, plans to bridge the digital divide and how computing has changed over the past 20 years. 13 May - Pakistan's ambitious plans for a virtual university, the video game celebrating 40 years of gaming and how technology is changing the way we watch TV. 6 May - Palestinian websites disrupted by the violence in the Middle East, the video game designed to help anxiety disorders and how secure is your computer password? 29 April - How to keep your computer safe from hackers, India's ethical hacker and the digital special effects for the forthcoming film, Spider-Man. 22 April - How the internet has united former foes in Kosovo, the promise of touch technology and rapper Chuck D on why musicians should embrace digital music. 15 April - Musical toys teach youngsters about music, Hong Kong prepares for smart ID cards and the many uses for Apple's iPod digital music player. 8 April - Bill Clinton on how technology can fight terror, training Nigeria's youth in computer skills and the robo-reporter destined for Afghanistan. 1 April - Giving old computers a new lease of life in Africa, the pioneer of free software speaks out and the virtual music studio changing the way the recording industry works. 25 March - Child soldiers in Sierra to swap their guns for computers, wearable computers give disabled children a voice and what to do if you are addicted to the internet. 25 February - The digital camera chip challenging traditional film, the hi-tech airships bringing mobile phone networks to the world and sealcams reveal secrets of the underwater world. 18 February - Mobile phones come to Afghanistan, how technology can help industries in the developing world and why the web can undermine your concentration. 11 February - Watching you while you surf, how video games are getting smarter and why people in Ireland refused to embrace new technology. 4 February - How telemedicine is helping mental patients in Australia, broadcasting the internet on the radio and how digital technology could help Olympic athletes win gold. 28 January - The home with the internet everywhere, when screensavers are a crime and using virtual reality to revisit Northern Ireland's Bloody Sunday. 21 January - A special edition on the hottest technologies to emerge at the Consumer Electronics Show, including the wearable computer for commuters, the wind-up charger for mobile phones and the smart home. 14 January - Asia's plans to link together hi-tech cities, a review of Apple's new iMac and behind the scenes as Mali prepares to host the African Cup of Nations. 7 January - How New Zealand is bring the elderly online, using virtual reality to tackle real-life problems and a look at some of the latest gadgets. 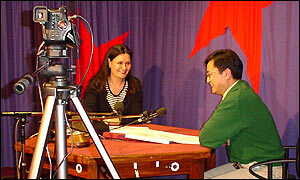 The programme is broadcast every week on the BBC World Service radio on Tuesday, Wednesday and Thursday. Local times vary.